Dirt Late Model / Modified / Big-block Modified concept specific - Aluminum Structure. Dirt-style finger bumps / indentation on entire steering wheel - MPI Orange Marker. Hole pattern: 3 hole (NASCAR Style). Dish of 2.25 inches. Extended padding on spokes for increased protection. Dish Depth: 2.25 inches. Dimensions: 18" x 18" x 4. 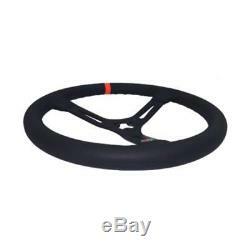 The item "MPI Dirt Late Model / Modified / Big Block Aluminum Steering Wheel MPI-DM-15-A" is in sale since Wednesday, June 27, 2018. 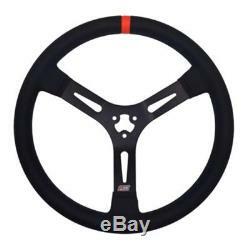 This item is in the category "eBay Motors\Parts & Accessories\Performance & Racing Parts\Dirt Oval Racing Parts\Late Models". The seller is "silvercrown90" and is located in Kalamazoo, Michigan. This item can be shipped to United States, Canada, United Kingdom, Denmark, Romania, Slovakia, Bulgaria, Czech republic, Finland, Hungary, Latvia, Lithuania, Malta, Estonia, Australia, Greece, Portugal, Cyprus, Slovenia, Japan, China, Sweden, South Korea, Indonesia, Taiwan, South africa, Thailand, Belgium, France, Hong Kong, Ireland, Netherlands, Poland, Spain, Italy, Germany, Austria, Mexico, New Zealand, Philippines, Singapore, Switzerland, Norway, Saudi arabia, Ukraine, United arab emirates, Qatar, Kuwait, Bahrain, Croatia, Malaysia, Brazil, Chile, Colombia, Costa rica, Panama, Trinidad and tobago, Guatemala, Honduras, Jamaica, Israel.